In Chapter 1 of the Rule, Benedict lays out the different kinds of monks. What wisdom might we find for today here? First, coenobites — monks who live in community — “are the most effective kind of monks” (p. 8). St Basil, who wrote his own monastic rules, was himself opposed to hermits. How can someone who lives alone fulfil the command of Christ to love others, to serve others? As Cassian observes, if you suffer the passion of anger, how will you ever overcome it if you never spend time with people to anger you? For us — deep community matters. It can smooth our rough edges. It provides accountability. It gives a place to live out Christian virtues, to learn from others, to grow in grace. Second, sarabaites. These are monks, so-called, if you will. I suspect (with no research into the question to back me up) that Benedict is taking a stab at aristocrats who claim to be ascetics but live on their villas with servi to take care of their needs. These people do not labour but rather live comfortably. Such as these are also a target of Cassian’s, and an example of what happens when people try to hold them to monastic strictness is in Gregory of Tours when there is a rebellion of aristocratic nuns. Third, gyrovagues. Jerome and Cassian both oppose these as well. These are monks who just wander around from monastery to monastery. They have no stability. What they fail to realise is that perhaps the problem with all of the communities through which they drift is themselves — they bring their own problems with them wherever they go. For us — this is a very Protestant phenomenon. Leaving one congregation or denomination for another whenever we disagree. Drums, preaching, music, the kind of ministry they do, how nice people are to us. What if we who leave were the problem in the first place? The spirit that inspires these is the noon-day demon of akedia, I think. We become listless, despondent, discontented with our situation, our discipline, our community. We think that a change of scenery will help. Evagrius and Cassian deal with this, as does St Anselm in a letter quoted by Eadmer in the Life of St Anselm. Fourth, hermits. Benedict himself, if we trust Gregory the Great, Dialogues 2, spent time as a hermit before becoming a coenobite. St John Climacus also spent time as a hermit. Because of what was said above about the virtues of coenobitism, one should only become a hermit after having grown much in grace. Cistercians have no place for hermits in their constitutions, much to the consternation of Thomas Merton, who so greatly desired that grace. A thought on hermits: They are never alone. Indeed, the cloistered monks have a hard time keeping the world out. Even monks of La Grande Chartreuse (who are a community of hermits who never speak) have written books to minister to the world (I’m thinking of Guigo II, on whom I’ve blogged here and here). In Jerome’s Life of St Hilarion, the recurring theme is that Hilarion keeps getting found out everywhere he goes, and people come for spiritual wisdom and miracles, so the hermit moves along. Jerome attributes his discovery to demons who want to disturb his solitude. I like to think the opposite — God does not give people the fruits of contemplation to hoard them but to share them (see Gregory the Great, Book of Pastoral Rule on that one). 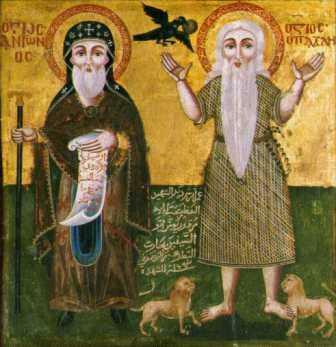 In John of Ephesus’ Lives of Eastern Saints, he tells the story of Simeon the Mountaineer, a hermit who went off into the mountainous regions of Mesopotamia (Assyria?) to be alone. There he met people who had been baptised but not catechised and who had no priests. Thus he found himself wrenched from the eremitical life into the life of active service, preaching to them and bringing them to a true faith in Jesus who saves them. Consider Richard Rolle, a hermit who was also a spiritual adviser to some nuns and wrote several books. Or, also in the 14th century, Julian of Norwich, who received visitors at her anchorhold. And, today, Father Lazarus, the anchorite who inhabits the Inner Mountain of St Antony the Great. St Antony went there to be a hermit, and a community followed him that exists to this day. Father Lazarus lives there, alone with his demons and prayers and Nescafé, but he receives visitors and even makes videos for the Coptic Orthodox youth!